Sharon Stack and Matt Ravosa joined the University of Notre Dame in 2011, coming from positions at the University of Missouri School of Medicine in Columbia, Missouri. Stack is the Ann F. Dunne and Elizabeth Riley Director of the Harper Cancer Research Institute (HCRI) and the Kleiderer-Pezold Professor of Chemistry and Biochemistry; Ravosa is a professor of biology with concurrent appointments in the Department of Aerospace and Mechanical Engineering and the Department of Anthropology. Stack completed her doctorate at the University of Louisville; Ravosa at Northwestern. The couple met as postdoctoral scholars at Duke University Medical Center in Durham, North Carolina. The next morning she found the note in her pocket but couldn’t remember who’d handed it to her. She looked his name up in the university directory, where he was listed as a visiting research professor. With some coaxing from her friends, she called. The first night they went to dinner, the next day they spent at the North Carolina State Fair, Stack says. Northwestern wasn’t her first choice. “I said I’d move anywhere but New York, Los Angeles or Chicago. We were in Chicago for 13 years, and I only complained for the first 10. When the kids (Nico, now 18, and Luca, now 16) came along, we decided to move on.” Stack and Ravosa both took positions at the University of Missouri, School of Medicine then on to South Bend and Notre Dame. After they bought the property, he cut the lawn once. 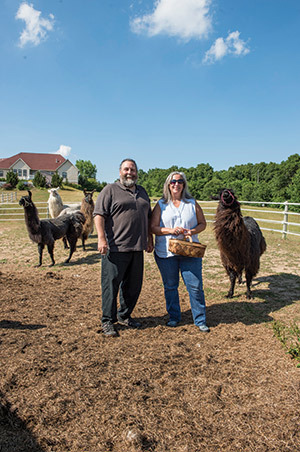 “I decided I needed some animals to eat the grass.” The llamas are all rescue animals and earn their keep by cropping some of the five or six acres of fenced pasture. The alpacas are also rescue animals, acquired from a friend who was shutting down a research project on animal feeding behavior and biomechanics at Ohio University. The llamas are named after types of pasta — Bucatini, Orecchiette, Fusilli, Ditalini, Gnocchi, Tagliatelle, and her daughter, Ziti. The alpacas are named after pasta sauces, Aglio e Olio and Carbonara. The dogs (not to leave anyone out) are June Bug, Stella and Fenway. Older son Nico just graduated from Edwardsburg High School, and will be attending Western Michigan University as a mechanical engineering major in the fall. Luca is a junior at Edwardsburg High School. The Mike and Josie Harper Cancer Research Institute in Harper Hall, dedicated in March 2011, comprises 55,000 square feet of office and research laboratory space and is located adjacent to Raclin-Carmichael Hall, which houses the IU School of Medicine, South Bend. The buildings are located on the south side of the intersection of Notre Dame Avenue and Angela Boulevard. Part of the funding for Harper Hall came from the family foundation of the late Charles M. “Mike” Harper, a former South Bend resident and the retired chair and chief executive officer of ConAgra Foods. Harper made a $10-million contribution to Notre Dame to support its cancer research programs, and the gift was matched with a $10-million appropriation from the state of Indiana to Indiana University for the project. Her areas of research interest include tumor metastasis, ovarian cancer, oral cancer, cell and molecular biology. 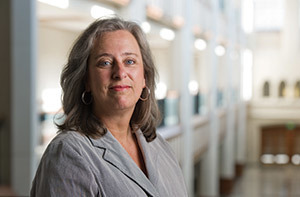 Stack has published more than 155 peer-reviewed research articles and reviews, and she was elected a fellow of the American Association for the Advancement of Science in 2012. In addition to faculty members from the Colleges of Science and Engineering, HCRI also has several faculty from the College of Arts and Letters, “focusing on quality of life and end-of-life issues,” Stack says, including psychology professor Thomas V. Merluzzi. Merluzzi studies coping processes in people with cancer, as well as in cancer survivors. As an example of cross-disciplinary collaboration, Stack notes the work of Hsueh-Chia Chang, the Bayer Professor of Engineering and director of the Center for Microfluidics and Medical Diagnostics. Chang is working with Reginald Hill, assistant professor of biological sciences, on an early detection method for pancreatic cancer. According to Stack, detecting pancreatic cancer even several months earlier could make a dramatic difference in outcomes for the patient. Pairing an engineer and biologist to tackle one of the deadliest forms of cancer is the kind of innovative approach that was central to Harper’s founding. “We’re trying to get researchers who perhaps don’t think about cancer research, but who have strong scientific methods and approaches, and let them know what our questions are,” Stack says. Ravosa grew up in a town called Longmeadow, Massachusetts, “which has the longest green, or town commons, in the state of Massachusetts,” he says. “It was incorporated in 1644. So I’m from a part of the country with an historical perspective on things. Stack and Ravosa do share some common research interests. Stack is interested in how mechanical forces affect tissues. “In tumors, you feel something hard in something soft. Ravosa’s focus is on whole animals and how mechanobiology (the interface between biology and engineering) affects evolution.” The couple has a collaborative research project focusing on the relationship between mechanical loading and tissue remodeling in the development and aging of the jaw. Ravosa has published close to 100 peer-reviewed research articles, books and reviews. He was elected a fellow of the American Association for the Advancement of Science in 2008. The technology has also changed radically, he notes. “We used to just look at the skulls and take measurements directly or take X-rays of them. Now we work with live animals. We do physiological recording. Then we look postmortem at the tissues, the cells, the genes. We use engineering approaches to skulls — why are they constructed the way they are? Then we put it all back together so we understand the genes that encode the proteins that result in differences in the biomechanical properties of the tissues that are affected in different ways, depending on what you do when you’re alive. For example, consider the Tyrannosaurus Rex. “The T-Rex used its teeth to slice and swallow. Teeth are tools, like chisels. Mammals take something and process it orally—that can take a lot or a little time, depending on what it is. Teeth are tools that you apply to those foods, and those foods require you to impart forces to them. Those forces affect the way the tissues grow. The research has implications for humans as well. There are two other interesting things about bone development in the skull that differ from bone development in other parts of the body, he adds. Another unique aspect of bone growth in the skull is that the bone comes from two tissue types. The bones in the body come from only one. So there are three things affecting bone growth in the skull: a diversity of loading environments (chewing on different types of food, harder or softer, effecting changes in the jaw); a diversity of tissue types — the precursors of bones; and a diversity in the way the bone forms. That’s just one clinical application. Developing a model for osteonecrosis of the jaw from chemotherapy is another. 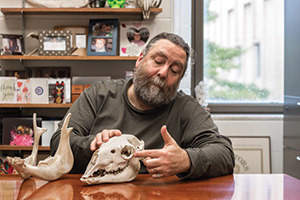 Although his research may have clinical applications, he’s primarily interested in bone from an evolutionary perspective. “Why do some animals have a complete bar around the eye socket and other ones don’t? A lot of it is asking those kinds of questions — if you’re an animal that has this kind of joint, you’re probably in a group of animals that all look like that. You can ask questions—compare one animal to another. “What we’re doing is exemplary of the way science needs to be done, has to be done. It’s cross-disciplinary. An engineer has a different take on science that a biologist. You have to incorporate new skills from other disciplines. That’s how you get advances. My post-docs are bioengineers. My students have engineers on their dissertation committees. I may be one of the few faculty members on campus with concurrent appointments in two other colleges,” Ravosa says. Indeed, having engineers as colleagues was a big part of his initial attraction to Notre Dame. Sharon Stack’s current research and grant writing focuses on ovarian cancer. Nearly 70 percent of ovarian cancer cases are detected after metastasis, which is the development of secondary malignant growths distant from the primary site of cancer, resulting in a five-year survival rate of less than 30 percent. Stack’s laboratory emphasizes the understanding of the molecular mechanisms by which tumor cells manipulate micro-environmental cues in order to more efficiently metastasize. Knowing how cancer spreads is a key step in stopping the metastatic process in this late stage. Recently, alongside HCRI researcher Yueying Liu, she led a team of researchers in a study that found that obesity contributes to ovarian cancer metastasis. The team used an integrative approach combining three-dimensional cell culture models, tissue explants and mouse models to evaluate tumor cell adhesion to cells that line the abdominal cavity. The researchers set out to determine whether obesity contributes to ovarian cancer metastatic success. In other words, are tumor cells better able to successfully metastasize when the “host” is obese versus lean? The hope is that further research will provide new targets for dietary and therapeutic interventions to slow or inhibit metastatic dissemination — thereby impacting the long-term survival of women with ovarian cancer. “We are just at the beginning of understanding this complex disease,” Stack says. The study was supported by grants from the National Cancer Institute and the Leo and Ann Albert Charitable Trust and by training fellowships from the National Cancer Institute and the National Science Foundation. Stack also points out the interdisciplinary nature of the research. In May, the University hosted the Midwest Ovarian Cancer Coalition. Researchers examined the current state of ovarian cancer research and discussed ways they might collaborate to more effectively combat the disease. Originally published by Carol Bradley at news.nd.edu on July 07, 2016.